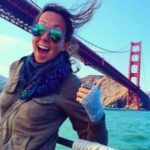 Kristin Kirk is a former high school math teacher and avid world traveler. After 5 years of living in Colombia, she now calls Boulder Colorado home. Together with her best friend, they started their blog Because I'm Write to follow a long time passion for writing.